What are the complications connected to surgical procedures to injured flexor tendons? What can be done when a flexor tendon shows adhesion formations that cause insufficient mobility of the finger? What can be done if the flexor tendon injury was only diagnosed very late or if the flexor tendon ruptures a second time? Does the occurrence of a complication in connection with a flexor tendon injury automatically stand for a poor outcome of the surgical procedure? At the time the severance took place bacteria travelled from the knife or surrounding skin deep into the wound. In addition, haemorrhages might have occurred. Blood or open tendon sheaths (the tunnels through which the tendons glide) offer an extraordinarily fertile ground for contamination. The treating physician will have to evaluate early in the process whether the administration of antibiotics is required and advisable in order to minimize the risk of an infection. Nonetheless it is not entirely possible to eliminate such risk. The primary injury may have also caused the severance of a nerve or blood vessel. Important nerves and blood vessels run along the thumb- as well as the pinky side of the flexor tendons and in many cases these nerves and/or blood vessels rupture as well as a consequence of the injury. Another source of damage to nerves and blood vessels close to the flexor tendons could be an accidental injury incurred during the actual surgical procedure. Even if the nerves get stitched back together typically an electrifying pain will stay behind in the area where the nerve was injured. Also there is a chance for a reduced sensitivity of the nerve. Worse case, should several blood vessels experience accidental severance at one time, the finger may even die off. Luckily this is not a very frequent complication. The reconstruction of a flexor tendon is a very sensitive and demanding task. Even experienced hand surgeons are not immune to bad surgical treatment results with insufficient mobility outcome. These bad surgical treatment results are often caused by adhesion formations between the suture mark of the flexor tendon and its immediate surroundings. Such complications can be frequently located in the narrow tunnels through which the flexor tendons glide (area formerly referred to as “no man´s land”). This complication is associated with a sutured flexor tendon which over time re-separates along the suture mark. If a patient performs flexing motions too early or too vigorously during the aftercare program, this potential risk is rather high. In order to prevent this complication it is crucial especially over the first months to perform all physiotherapeutic exercises within reasonable pain levels and in avoidance of painful flexing motions. It is possible to incur adhesion formations along the suture mark of a surgically treated flexor tendon injury. The consequence hereof could be that the tendon will not properly glide through the pulley system/tendon sheath. Through an increased strain the tendon ends may now slowly start to separate along the suture mark (red arrows) which in the worst case may lead to a secondary tendon rupture. As for any other injury to the hand – or any other surgery – flexor tendon injuries may as well lead to chronic regional pain syndromes (CRPS). Once the scar matured a surgical separation of the unwanted adhesion may be considered. The surgical approach in this case is geared towards the separation of the tendon from the tendon sheath. Oftentimes secondary interventions to the flexed joints become necessary. Such procedures may often be helpful to improve functionality; however they will typically not provide an entire recovery it. In a case like this it is not possible to reestablish the necessary proximity between the two separated tendon ends. The spread-apart flexor tendon ends have most likely shrunk therefore making it impossible to appropriately suture them. So in a case like this a tenden transplant becomes necessary. There is one tendon along the forearm that has no function. This tendon is called palmaris longus tendon. Approximately ninety percent of humans dispose of a palmaris longus tendon. 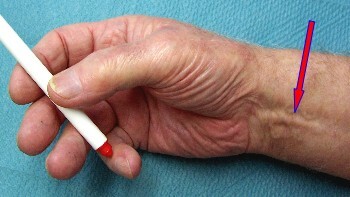 This tendon can be utilized as donor tendon by inserting it in between the tendon ends. The main principle of tendon transplants surely is easily to understand. The execution of such interventions however is not simple at all and should only be carried out by an experienced hand surgeon. The palmaris longus tendon (red arrow) is easily visible in the forearm, when firmly grasping a small object. There really is no one-fits-all answer to this question. If secondary surgery becomes necessary (for example a tendon transplant) chances are that the outcome may not turn out as ideally as desired. 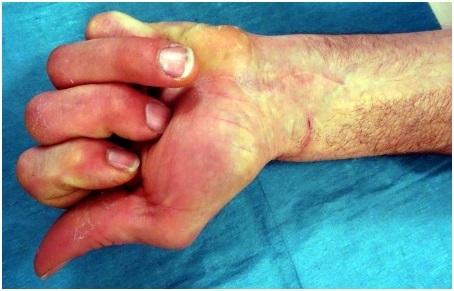 The two images show a situation after performed reconstruction of a flexor tendon which incurred a second rupture. In this case the palmaris longus tendon from the forearm was taken and transplanted between the two severed ends of the flexor tendon. Unfortunately a significant loss of stretchability of the proximal interphalangeal joint of the injured middle finger could not be avoided. The loss of stretchability associated with the proximal interphalangeal joint as seen here accounts for 80°. The stretchability of the finger is acceptable; the outcome of the procedure however can be deemed as unsatisfactory. 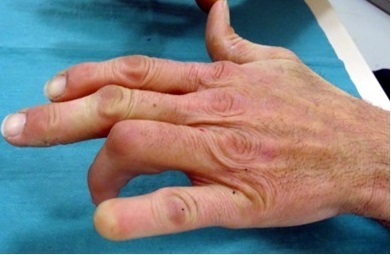 Due to the heavily compromised stretchability of the ring finger the patient unfortunately bumps it frequently during work or during everyday activities.